Today is a free, weekly magazine published by Bosley Publishing. As the original visitor's guide to Las Vegas, it is the ultimate source for information on "What to do and see—Where to go and be." The magazine is distributed in major hotels and casinos on the strip and downtown Las Vegas; motels and inns; McCarran International airport; tour operators; convention and visitor centers; restaurants and shops; rental car companies; and the neighboring areas of Primm and Jean, Nevada. North Valley Magazine, LLC publishes full-color, full-gloss bimonthly publications providing content that celebrates the lifestyles of various communities. The editorial focuses on living life to the fullest, showcasing the best of the communities, and providing important content to readers. Each issue caters to a diverse audience, including active families, sophisticated young professionals, and active seniors who enjoy travel, home improvement, dining, fashion, and outdoor activities. The next time you look at your Audit Report and Publisher's Statement, you'll find something new in the small print at the bottom: "Printed on Recycled Paper." Verified switched to using 100% recycled paper for its printed reports. The new paper uses 10% post-consumer recycled fiber, avoiding the use of virgin fibers harvested from endangered forest. Tim Prouty, CEO says, "Doing what's right for the environment is very important to all of us here at Verified. We see this happening throughout the publishing industry and applaud the efforts of everyone supporting environmentally responsible behavior. It's not only good for corporate America, it's smart ecology and smart economics." NOW Magazine is a free weekly alternative newspaper published in Toronto, Canada. This summer, Brian Francis, NOW's Promotions Manager, unveiled NOW's Box Design Challenge, a contest to transform ordinary street boxes into pieces of art. NOW issued an open call to local artists for submissions to the Box Design Challenge. According to Francis, the response from the community was enthusiastic. NOW's art department reviewed the many proposed designs sent in and chose the 10 designs they felt were the strongest for the boxes. NOW gave each of the 10 finalists a blank street box (at a cost of about $150 each) and $100 gift certificates towards art supplies. The winner was chosen by the art department and received a $1,000 grand prize. There were no limits on the design and no requirement to include the NOW logo or any other NOW-related decoration. Artists' designs ranged from psychedelic art to Italian Renaissance. The only restriction was that the final creation had to be a working street box—one that could be stocked with magazines and from which readers could remove copies. The 10 decorated NOW street boxes were put on display at various locations around Vancouver such as restaurants, stores, galleries, and hotels. NOW tried to match the location with the box theme. Most of the locations already had boxes, so they were able to swap out the regular box with the art box. Each of the boxes had a placard that listed the artist, title, and inspiration for the design. It also encouraged readers to go online to the NOW website and vote for their favorite to win the Reader's Choice Award. According to Francis, the promotion increased NOW's circulation. "There was some confusion at first because some people thought that the boxes weren't functioning," said Francis. But retailers told NOW that the program was good for business. Francis said the Box Design Challenge worked as a three-prong approach. It tied print and online together. It also gave NOW a retail presence. 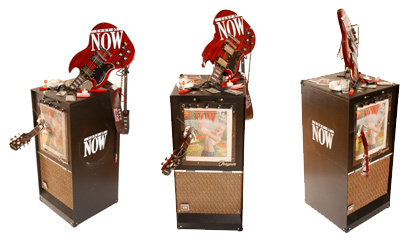 The winner, "Breaking News on Tour '07" by Steven Houston is currently on display at the NOW office. Some artists took their boxes back after the contest and are using them in their own art shows. NOW is thinking about auctioning some of the boxes off for charity. Go to www.nowtoronto.com/challenge to see the 10 finalists. If other publishers are considering a similar program, Francis suggests reaching deeper into the art community to include local colleges and more new and upcoming artists. He also suggests indoor locations for display since many of the designs were not waterproof. Francis said that NOW did something similar last year called the Designer Challenge. Local designers were asked to come up with a clothing design using NOW magazines. Francis said NOW tries to involve local artists in various events they do throughout the year. New and emerging digital media platforms may be the rage on Madison Avenue and in the news media, but some highly regarded consumer research suggests they still have a long way to go before they replace traditional media as effective advertising alternatives with most consumers. The conclusion, which comes from the 2007 release of Compose, a collaboration of WPP Group's Kantar Media Research unit and Netherlands-based Pointlogic, is one of an array of new research studies being used by big media shops to evaluate the efficacy of using a wide range of communications platforms to reach consumers. Of the 33 channels—ranging from traditional outlets like TV, radio, and print to new media and marketing channels like sampling, promotions, and direct marketing—the study found that the vast majority of consumers still find mainstream media to have the greatest influence. Consumers recognize TV as the No. 1 medium for building awareness: 43% rate it as excellent or very good. Magazines (31%), newspapers (29%) and radio (24%) all also performed well, the study found. Asked which media helped them decide whether "they can trust a brand," TV ranked first again with 26% of the respondents, followed by newspapers (21%) and magazines (19%). The newest media tracked in the survey—platforms like video games, video-on-demand, interactive TV, and streaming online video—by contrast are still regarded by most consumers as being niche communication vehicles. Their scores on these measures ranged between 2% and 5%. "When we ask consumers about how they perceive different forms of advertising, we get a higher score for the traditional media, and the emerging media are scoring quite low—lower than I expected," says Peter Kloprogge, a co-founder and managing director of Pointlogic's U.S. media division. "The conclusion is that the traditional media should still be the cornerstone for brand advertising and that the new media still have a long way to go before they can replace the traditional media." On the other hand, Kloprogge notes that the overall trend line favors newer media platforms in the long run, but that for some current communications objectives, they "just can't yet deliver." Kloprogge emphasized that this is only the second installment of the Compose research, but that the early indications from the data are that new media are getting more attention in the industry "than their current position would validate. As such, you could say they're overhyped." That said, the Compose findings suggest that new media are having a more profound impact on marketing decisions among those consumers who favor them. Eighteen percent of interactive TV users consider it effective at conveying trust, while 12% of video game users rate it highly for driving awareness. For paid publications, the number of people who pay for a subscription or purchase a paper on the newsstand verifies their claimed circulation. For free publications, however, the confirmation of claimed circulation is reporting net circulation figures. Verified reports net circulation for publications that are distributed two or more times per month. Net reporting provides the same litmus test as payment does for paid publications. More than 50 years ago, Verified developed this auditing technique as the most accurate way to determine a free publication's circulation. 1) Your paper reaches real people. Readers make an active choice to pick up your paper and net reporting proves that. The number of papers actually reaching readers is the way you can confirm to advertisers that their ads are being seen. 2) Your paper connects with their target demographic. Net circulation tells advertisers that your paper is reaching their target demographic. Your paper provides the ideas and information readers want—that's why they choose it. 3) Your paper has efficient and targeted distribution. Effective distribution is key to good performance. Net circulation reporting means that distribution locations are carefully tracked and analyzed to reach the maximum number of readers. It also builds goodwill in the community—your advertisers' potential customers. 4) Reporting net circulation provides data advertisers can use to calculate essential metrics. CPM, ROI and total readership is information your advertisers need to make smart buying decisions. 5) Advertisers can buy with confidence. Net reporting is the "gold standard" for auditing free papers. Your paper is committed to accurate, transparent reporting to confirm your paper's performance. When advertisers ask, "Can you prove it?" You can answer, "Yes." If you have questions about net vs. gross reporting, please contact Verified at 415-461-6006.